I just stumbled on to a very cool idea, a sort of picture research online community. 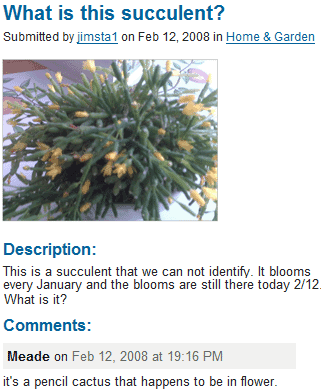 The basics of PicAnswers is that you upload a photo, and ask a question related to it. If you visit the site you’ll instantly know what I mean. What might seem like a fun place at first, actually has very broad research potential. You found an old baseball card lying around, and it may be worth hundreds of bucks. Just snap a shot and ask if anyone knows. If you find something you like on the web, add the pic, and ask where you can buy it. Since it is community based you have a much higher chance of a good answer, than asking your friends, or posting a question on a forum. I also like the fact that you can randomly go through photos, answering some you like, and joining the discussion of unanswered ones. This is an online service that looks like fun to participate in, but there are some tools that could make it better. For example, it would be nice to be able to get RSS feeds of either all questions, or just separate categories. There is a drawback to the service, which is mainly the fact that it’s new and that it’s community based. This means that there aren’t too many users, so don’t expect a flood of comments, but you still may get some useful tips. Notice that the answer to the question in the pic was posted on the same day as the question itself. As the service grows there will be more and more people, but that also means more and more spam and more and more idiots ruining the fun. Weather the service will be able to fight this is questionable, we’ll have to wait and see. Update: The service is no longer available, and there does not seem to be a comparable service on the Internet available at this point in time.